My husband’s favorite dip would be Buffalo Chicken Dip. If I didn’t swoop in to stop him, he could probably down an entire recipe himself. It is also a hit with the crowd wherever we take it anywhere, so I thought- why not make an easy slider dinner out of it?! These Buffalo Chicken sliders are jam packed with flavor! 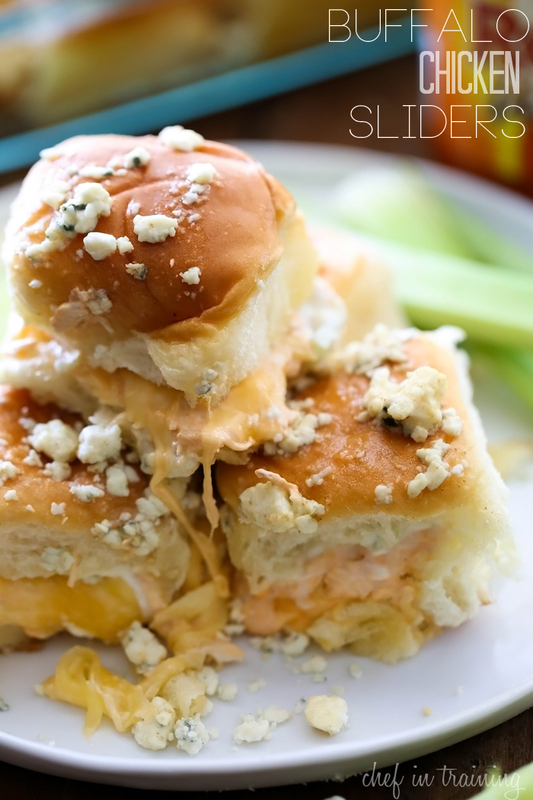 Creamy buffalo chicken, a blue cheese spread inside a soft bun baked and baked to perfection! We could not stop gobbling these up! Everyone who tried them gave them rave reviews. Give them a try and see for yourself! These are a crowd pleasing dinner for sure! So much flavor and SO easy to make! Combine cream cheese, buffalo sauce and chicken for filling, stirring until smooth and set aside. Combine all of the ingredients for the Blue Cheese Spread and stir well to combine. Set aside. Slice rolls to open on one side. Spread top and bottom of the rolls with the spread mixture. Fill the inside of the slidders with the filling mixture. Put Gouda cheese on top of the mixture and close sandwich. Place sandwich in a spayed 9x13 baking dish. Repeat with each roll. For topping melt butter and add the blue cheese and cayenne pepper. Pour the topping over the top of the rolls. Cover with foil and bake for 13 minutes at 350 degrees F. Take the foil off and bake another 2-3 minutes.